Surprising Health Benefits of a Calf Stretch : Improve Your Posture Today! I think everybody did some version of a calf stretch in his or her life. The simplest one is to put your arms on a wall and lean towards it while keeping one bent leg in front and a heel of a straight leg behind on a floor. Many runners do it regularly. What if you do not run or do not go out for a walk, and do not like to exercise? Alternatively, you may be a person who exercises regularly, lift weights, cycles, etc. but never quite have time to stretch before or after the exercise. Whatever is the case, you should consider adding a Calf Stretch to your daily routine. You may be surprised to learn that a Calf Stretch a day may keep a doctor away! The obvious result of this exercise will be that a Calf Stretch will lengthen chronically shortened calves due to the heeled shoes and long sitting. But why would you want to lengthen your calf muscles? What are the surprising benefits? We need a certain leg length in order to have a proper standing alignment as well as a proper gait. 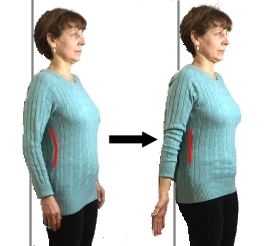 Standing and walking in aligned manner loads our postural muscles correctly. When we properly engage these muscles on a daily basis, they can support our spine and keep us upright. to these Free 5 Video Lessons. 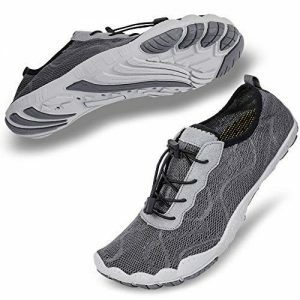 Do you have plantar fasciitis, bunions, or other foot issues? Stretch your calves! Improved calf length will allow you to align your hip with your ankles as shown on the picture above without an extra effort . Add a healthy load to your hip bones (osteoporosis anyone?) and will remove undue pressure from the balls of your feet. Your arches will appreciate it. Important daily exercise for all foot issues. Improve your balance and gait because you will start standing and walking in a form that strengthens lateral hip muscles. Just as an FYI: in our all-day sitting society everybody has weak lateral hip muscles. Do you have back pain? Stretch your calves! “Tight calves are a major contributor to back pain. The tighter the lower leg, the more one’s gait pattern whips the upper back forward and contributes to curling of the upper spine. Adding a daily calf stretch to any exercise routine helps to better align the spine”. Katy Bowman. Alignment Matters. Do you have persistent headache and neck tension? You may need to lengthen your calves! In one of her podcasts, Katy Bowman ( a biomechanist and a founder of Nutritious Movement™) explains how walking with shortened calf muscles is similar to creating a slow-speed whiplash injury. With every step you take, your head goes accelerating forward but is yanked back by your short calf muscles. It may be small but it creates an extra motion at the neck and the need for you tense it to withstand it. This constant tension in your neck may result in chronic headaches. You may be stretching your neck regularly without noticeable results without realizing that you are walking in a way that is creating the tension in your neck. Below is the version of a Calf Stretch that I recommend to all my clients. I learnt this exercise from Katy Bowman, a biomechanist and a founder of Nutritious Movement™. The best prop for this exercise is a very inexpensive foam half-roller you can buy at Amazon. However, you may start doing it right away using a tightly rolled bath towel. In order to maximize the benefits of this stretch, please pay attention to your initial position. Your form will determine whether you will be able to stretch a rarely used part of your calf or not. Feet parallel means that the outside of your feet are parallel – you will feel pigeon-toed. 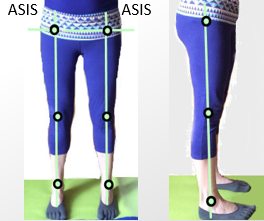 Front view: mid-ankles are in line with ASISs (the sticking out points in front of your pelvis). Side view: transfer the weight of your body mostly to your heels to align your hips with knees and mid-ankles. It will create a vertical line between your hipbone and your anklebone. Without changing a right foot orientation, place it on a half-roller as high as you can (if it is too painful, slide your foot down). Shift most of your weight to the heel of your right leg, but do not allow your hip to shift to the right as well. Do NOT rotate your pelvis forward as your leg moves forward. For some of you, the stretch in your calf muscle may feel so strong, that you will just stay in this position for 30 seconds to 1 minute. However, if you can, move your left foot forward to the point of your maximum stretch that you can COMFORTABLY TOLERATE. Stay in this position for 30 seconds to 1 minute. Do this stretch whenever you can, several times a day. If you only have time for one exercise, stretch your calves. every time you take a computer break.